Taylor Community resident Russell Orton was recognized Monday for his Army service during World War II, which earned him a Silver Star. 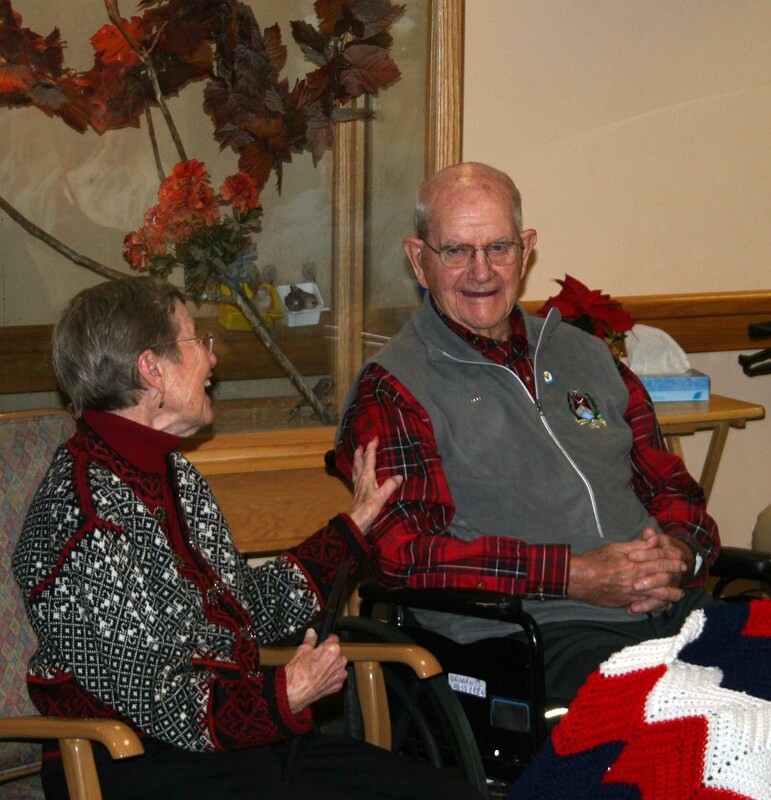 As his family and friends looked on, volunteers from Central New Hampshire VNA and Hospice presented Mr. Orton with a lapel pin, certificate and hand-knitted red, white and blue lap blanket made by women from the Laconia Congregational Church through the “Stitches of Love” program. Peter Cassell and David Shea, volunteers from the Central New Hampshire VNA and Hospice made the presentation at Ledgeview’s Assisted Living building. The “We Honor Veterans” program is a collaboration of the Veteran’s Administration and Hospice which ensures support of veterans and their families in times of need. The certificate pays special tribute to Mr. Orton for his military service to America and for advancing the universal hope of freedom and liberty for all. The 93-year old was a second lieutenant in the 351st Infantry Regiment on April 29, 1945 when his company was rounding up 500 prisoners in the town of Bassono del Grarpa, Italy. When they were notified Germans were progressing toward the town, the first platoon went to investigate and Lieutenant Orton led his men to high ground. As they neared higher ground, they were pinned down by enemy fire coming from a house. With enemy fire all around him, Lieutenant Orton moved throughout the area, bolstering the weak, shouting words of encouragement and directing fire against enemy targets. Picking out the squad nearest him, the Lieutenant led an attack against the three enemy machine gun sites. During the fierce firefight that ensued, the lieutenant personally accounted for seven enemy deaths, forcing the remainder to flee. Through his aggressive and gallant actions, the enemy became completely disorganized and easy prey. His men then captured 117 prisoners. Besides Mary, several family members were on hand for the presentation, including daughter, Leslie Mahar; son, Clark Orton; and stepdaughters Samantha Jewett and retired Navy Capt. Ellen Jewett.